The history of the city of Larnaca is inextricably linked to Saint Lazarus of the Four Days and Friend of Christ. According to the tradition of our church in Cyprus, Saint Lazarus, after his Resurrection, fled the Holy Land “for fear of the Jews” conspiring against him and sought refuge to Cyprus. He was ordained by the Apostles Paul and Barnabas as the first Bishop of Kition where he shepherded until his second death around 66 AC. Since then, Saint Lazarus remains the Patron Saint of the city. The tomb with the relic of Saint Lazarus was found in 890 AC, when by order of Emperor Leo VI, The Wise, it was transferred to Constantinople, as the tradition of those days required that all Saints should rest in peace in Constantinople. In exchange, the Emperor constructed a majestic temple where his tomb was found. Much of today’s church of Saint Lazarus is the original three-aisled Byzantine church, built at the end of the 9th century, which later underwent reconstruction, additions, restorations and numerous repair works. The history of the ecclesiastical museum of Saint Lazarus began in 1922 when doctor Neoklis Kyriazis was a member of the then committee of the church. Do(zens of byzantine icons and ecclesiastical objects were gathered in the building of the mutual-teaching school, and the first museum of Saint Lazarus was thus created. 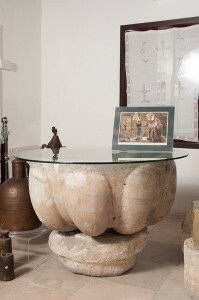 These artefacts – over eighty – were initially transferred to the Department of Antiquities of Cyprus and then to the Larnaca District Museum, which opened in 1948 and was housed in the medieval castle on the coast of the city at the then Turkish-Cypriot quarter. Unfortunately, due to the inter-communal violence of 1963-64, the castle and the entire Turkish-Cypriot quarter were cut off from the rest of the city. A large number of the museum’s registered objects have been looted and are still missing (photo 3). It took many years to reconstitute the museum of the church. In 1990, an inauguration ceremony was held by the unforgotten and late lamented Patriarch Parthenius III of Alexandria at the western loggia of the courtyard, in celebration of the 1100th year anniversary of the founding of the church of Saint Lazarus. For more than 18 years, the museum was operating with only two rooms and its main exhibits included post-byzantine icons, sacred silver utensils, vestments, old books and some wood carvings. Many of the exhibits displayed as well as some dedications by the believers were used by the church. 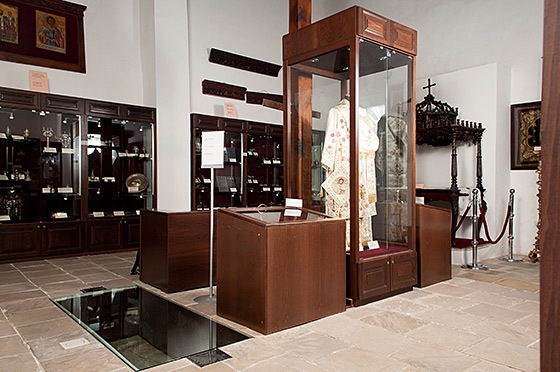 Upon a recommendation of the Ecclesiastical Committee, the museum underwent extension works in 2008, adding three new exhibit rooms – one on the ground floor and two more on the first floor of the southern loggia – while the old ones were fully refurbished. Due to the radical changes carried out, the church had to stop operating until the completion of all necessary works that lasted for more than two years. The reconstitution of the museum was carried out in accordance with the international standards and systems for the proper storage and exhibition of the artefacts. The official inauguration ceremony of the new byzantine museum was held on Saturday, 16 April 2011, by His Eminence Archbishop of Cyprus, Chrysostomos II. Today, the museum houses valuable byzantine and post-byzantine icons. Most of the icons come from the church of Saint Lazarus and some from other churches within the region of the Bishopric of Kition. The exhibits also include old books and Gospels, sacred utensils, candle holders, wood carvings, vestments and many other objects of the church dating from the 16th to the 20th century. The Byzantine Museum of Saint Lazarus consists of five rooms covering an area of 145 square metres, as shown in the plan of the exhibit rooms.